When I was a little girl we would sometimes go shopping for our Christmas tree on Christmas Eve morning. We never had a lot of money, and usually by Christmas Eve the nice man at the tree lot would give my mom, three excited little girls in tow, our tree for free. And we’d take it home and set it up and spend the day decorating it. We’d start with as many white twinkly lights as the skinny thing would hold. Then we’d add the clothespin soliders my mom made years ago, and the pretty candles my dad brought home from Germany. Then we’d hang it with candycanes and red curly ribbon and in my mind it was the most beautiful thing ever. But my very favorite part about decorating those Christmas Eve Trees were the gingerbread boys. This is Day 2 of my Handmade Christmas series. For as many years as I can remember my mom and my sisters would make gingerbread boys at Christmas. Sometimes they were to hang on the tree, and sometimes they were just to eat. (One year our dog found himself alone in the family room and ate every gingerbread boy on the bottom third of the tree. He even nibbled off the legs of the one’s just out of his reach. Poor guys, they went down bravely.) 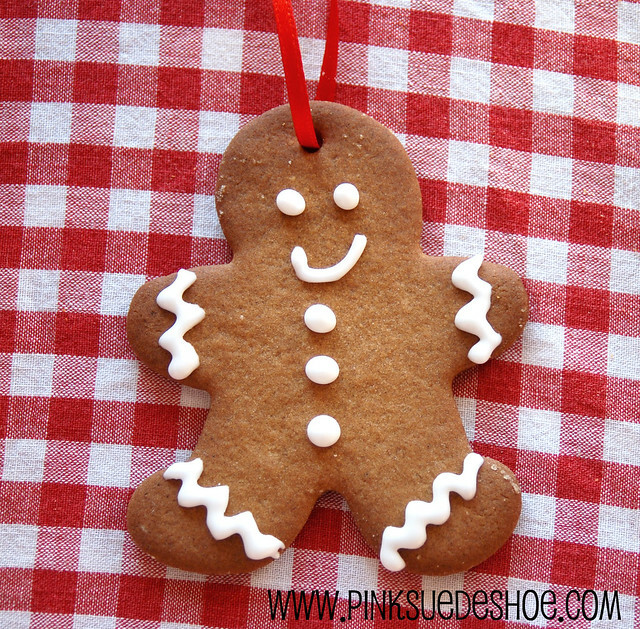 It was so much fun to sit around the dining room table together with stacks of gingerbread cookies ready to frost. Then we’d string them up with a bit of red ribbon and hang them up on the tree. With the candy canes and the candles and the toy soldiers I thought it looked like a Christmas dream come true. I spent yesterday afternoon baking some gingerbread ornaments for our tree this year. I think we are going to get our tree tonight and then I can hang them up. So while I sat in the kitchen daydreaming and decorating my stacks of boys I got a little carried away. I usually do. I just can’t do them all the same. Though cute, those straight rows of buttons and happy smiles get boring. This guy escaped from the hospital. He should still be in bed. You see, he was in a skiing accident and his face got a little sqwunched,* not to mention his buttons are all out of line and he’s still got a bandaged head and a cast on his leg. But he didn’t want to miss his big chance to be famous here on the internet. So he ran away for fame and/or fortune. Or maybe he hopped away, you know, on his good leg. This guy was outside playing with his gingerbread friends. He’s wearing mittens and snowpants and boots, in case you can’t tell. They were having a snowball fight and this poor dude took one right to the face. No one told him to duck. Ah, the possibilities for gingerbread men stories are so endless. I absolutely love it. For the past few years I’ve made gingerbread boys for all of my neighbors. Each one decorated a little different. I think it was two years ago I was on a roll and made some football player Boys and an Astronaut Boy, and even Darth Vader Boy. I love making them so much. It always reminds me home, and it’s such a fun way for me to spend an afternoon. And seeing them all hanging up on my tree reminds me of how magical Christmas is for children. I mean, really, a tree covered with candy canes and cookies? Pure Christmas Magic. *Scott and I just had a lengthy discussion about how there is no correct way to spell “sqwunched” because sqwunched is not in fact a word. (So he says. I was definitely on the other side of this conversation.) He kept telling me that in this universe it is impossible for a gingerbread boy, or any other boy for that matter to have a “sqwunched face”, skiing accident or no. In THIS universe his face would have to have been SCRUNCHED. Totally boring, predictable and unimaginatively scrunched. Lame, right? We finally decided that if you happen to be living in a parallel universe THEN you can have a gingerbread boy who got in a skiing accident which left him with a broken leg and a SQWUNCHED face. So…. that being said… hello from The Parallel Universe. I’ll be back soon. Mix all ingredients together and turn dough out onto a generously floured surface, knead a few times to form into a ball. Roll cookies to about half an inch thick and cut out. Bake for 11 minutes at 350 degrees and cool completely on a wire rack before decorating. Make these boys the same as above, but don’t use cloves or ginger or nutmeg. It’s ridiculous to use those expensive spices for something that your dog might possibly devour. And besides, after it’s been hanging on your tree for a month you’re not going to want to eat them anyway. So don’t waste the good spices. Don’t leave out the cinnamon, it’s cheap and it will make them smell delicious. 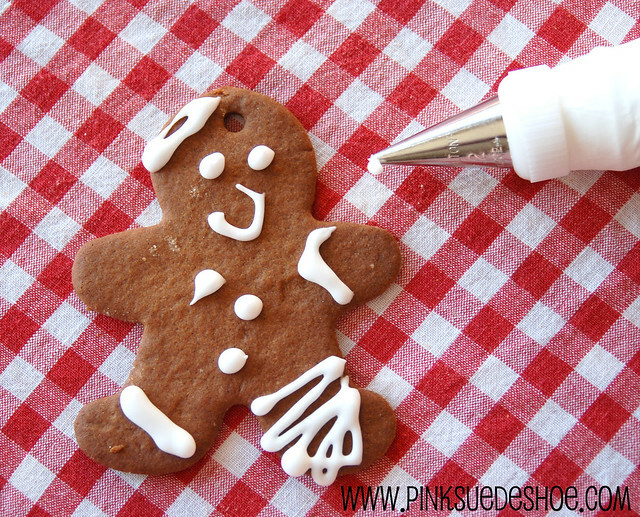 Roll gingerbread dough to about 1/8 an inch thick and cut out. Line them up on your cookie sheet and use a drinking straw to poke holes in their heads for hanging before you bake them. (Wow, that sounds so morbid.) You want these guys to be really thin. If they are too thick the extra weight of the cookie will make them too heavy and their heads won’t be able to hold them up. One night you’ll hear someone you’re pretty sure isn’t Santa crashing around in your living room and in the morning when you wake up the floor will be scattered with fallen boys. (Ask me how I know.) Also, you want to cook them until they are pretty dark, but not burned, just really crispy. If you hang them on a real tree they will absorb some of the water evaporating off your tree and if they get too soft, they will also break through their hangars and tumble to the floor. Again, ask me how I know this. So, roll them extra thin and bake them a few extra minutes. Beat until pretty stiff and spoon it into a pastry bag, or a ziplock bag with a teeny snip taken off the corner. Start with a teensy teensy snip, you can always make it bigger if you need to. Those gingerbread boys look awesome! It inspired me to make some. I love it! These are amazing. Even your icing is done perfectly. I love your boys! I think I need to make some this year! Love your memory stories. Here’s mine: In addition to our real Christmas tree, my mom always set up a small artificial tree on the washstand in the front hall of our house and it was called “the cookie tree”. She made gingerbread and sugar cookies for that tree that we helped decorate and whenever friends came over, they could take a cookie off the tree. Wow, I’m pretty lame because I’ve never done that with my kids….we make a gingerbread house every year, though. My mom also made decorated gingerbread boys for every person in each of our classes at school. Every boy was put into a plastic sandwich baggie with a candy cane and tied with a curly red ribbon. Her right thumb would be swollen and blue for days after squeezing all that royal icing through an old metal icing plunger thingy! Those are amazing! You are 12 kinds of awesome. I’m definitely trying out this recipe. P.S. 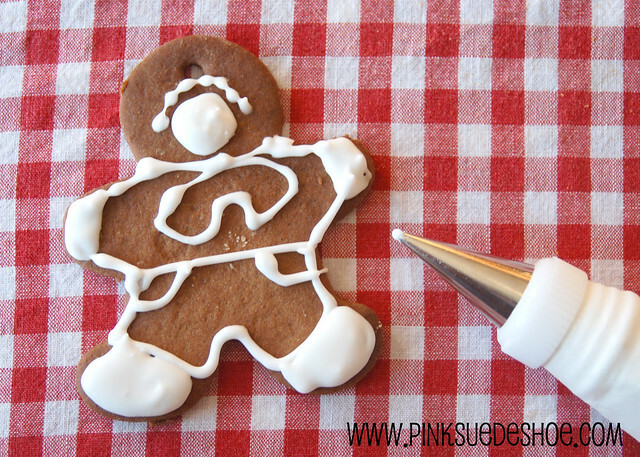 Would you mind if I made gingerbread girls too? I have both kinds of cookie cutters 😉 . We always put our tree up on Christmas Eve, too, down on New Year’s. Sometimes it was FREE by the time we got there. Ginger boys would look so great on a tree! I’m looking forward to all your Christmas posts. Haha, your gingerbread stories about “the boys” could probably fill a story book? Fun, and they look so good, both to eat and hang up in the tree. Thanks for sharing! 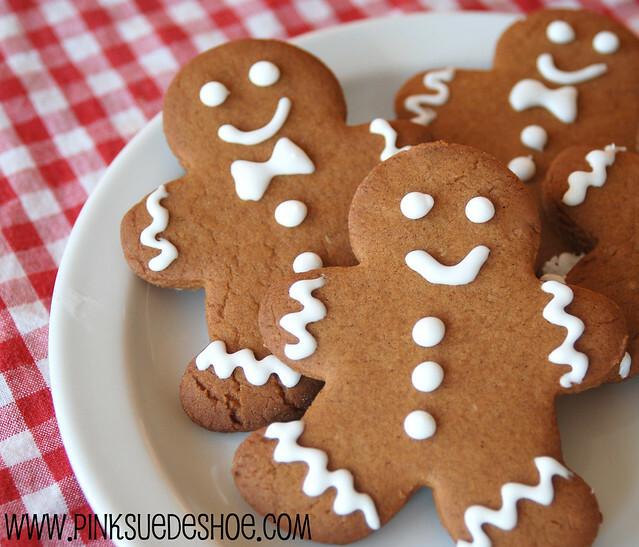 Since I am still, after all these years, still looking for the perfect gingerbread boys recipe, I MUST try yours! The very first year I made gingerbread boys to hang on the tree was when Diane was only three – the same year I made the advent calendar she still hangs every year! But, unfortunately, we had an unusually humid winter that year and all night long I could hear them dropping one by one from the branches onto the floor as gravity pulled the little string through the soft gingerbread. Sigh! Thank you for thinking to add this favorite to the cookie swap – everyone needs gingerbread boys to get through the holidays!